The Bluffs, Northwest Florida’s Industrial Campus is a 6,000+ acre master-planned development suited for industrial/manufacturing located in one of the most beautiful regions of the country, Northwest Florida. Situated in Escambia County just north of the City of Pensacola, the campus is bordered to the east by the Escambia River, and the University of West Florida to the south, with access via existing entrances from the west. The Bluffs offer tenants a wide range of sites and configurations to fit most industrial applications. Highly accessible, the multi-modal Campus is a nexus for the region near the I-10 corridor with road, rail and barge service. Tenants enjoy the convenience of commercial air service through Pensacola International Airport and the Port of Pensacola. The Pensacola MSA offers direct connectivity to all four compass points providing businesses the ability to reach national and global markets efficiently. An expansion of the existing manufacturing corridor, the new master-plan has been designed to allow flexibility to accommodate a range of advanced manufacturing operations. Of the 6,349 total acres of the site, more than 2,500 are available for use comprising more than 60 sites. Lots average in the 10 – 50 acre range but can be configured for much larger project needs. The Bluffs offers a combination of large sites for heavy manufacturing supported by sound infrastructure and connectivity. Both rail service and shallow draft barge service are available to portions of the campus. The campus is supported by robust public water and sewer, electric power, natural gas, and telecommunications services. Availability of process steam, reclaimed water, methane and other industrial by-products that provide the nucleus of an industrial eco-park. High quality design and construction. Physical characteristics such as elevation of much of the site provides natural benefits to some industrial processes. According to a recent Wadley Donovan Growtech labor study, The Bluffs provides manufacturers access to a significantly-sized workforce forecasted to grow at a strong pace over the next five years. Average employee earnings in the Pensacola MSA are lower than the national average and lower than competing metro areas. Surveyed employers report there is a good availability of a variety of skills, and good experience work ethic and productivity. The labor sheds produce a highly educated workforce, with a higher-than-national percentage of residents with post-secondary education. The Bluffs, Northwest Florida’s Industrial Campus will be developed in phases working with current tenants and future commitments in mind. 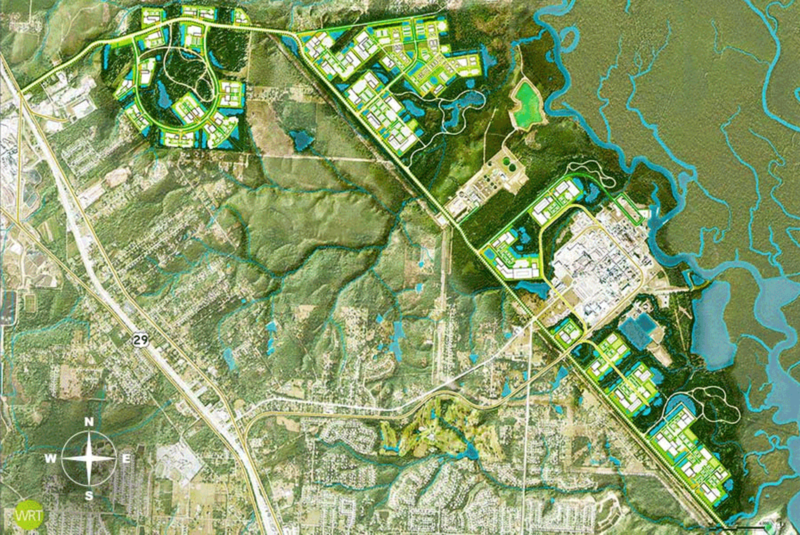 Envisioned to complement industrial and manufacturing operations at the site, the master-planned campus will integrate the location’s natural assets for a unique setting providing business benefits, access to nature, and a variety of recreational benefits to workers and residents of the area. When complete, the campus is envisioned to be an environmental showcase, providing a model backdrop balancing the needs of industry with an environment that helps to attract and keep a diverse, dynamic workforce.